Have, rather belatedly, rejoined your site. Just for fun I decided to look at the pictures and do the quiz. Surprisingly enough I did quite well. The pictures were lovely. Never realised that Manchester could look so picturesque - it's wonderful what a layer of snow can do. I'll keep popping in and out of the pages when I'm not too busy at work. I'm so pleased to be able to access EWM again and look forward to more pictures. Glad you did well on the quiz. Actually, Manchester can be quite picturesque even without a layer of snow. As I write this, there is more snow falling. Pop in to EWM whenever you like! I really enjoyed doing the 'snowy' quiz and got quite a few correct answers!! Glad to hear that. I tried to include a range of questions from the blindingly obvious to the very obscure! I'll do another quiz soon. I have just discovered your website on a dull and rainy afternoon in Auckland New Zealand. Having just read the letter from Keith Barton (Jan 2000)I am having my first taste of homesickness in 40 years. Did I know Keith? - I think not but we certainly played in the same places at the same times. We lived around the corner in Parrswood Road - next to Norris' the grocers; Parrswood Hotel and the Capitol. As an avid bike rider from an early age I know the bike shop he mentioned well but most of my gear came from the little shop by the traffic lights in the village. My main purchases there being a JRJ and an Ellis Briggs - my brother still has the Ellis Briggs. A product of St Paul's (Withington) and Didsbury National I have dined out for years on the "Shoe box in't middle o' road" stories and could not wait to take my wife to the "School of hard Knocks" - Didsbury Nash. Imagine my surprise to see Elm Grove Primary in its place - the same buildings but transformed. Flash classrooms and a kitchen better than most hotels. What would "Fatty" Gratton have thought of it? Where is Ernie, my mate from Didsbury Nash, who everyday beat up Beaver Road kids to sharpen his appetite for lunch? First taste of homesickness in 40 years because of something you read on my website? I must be doing something right! 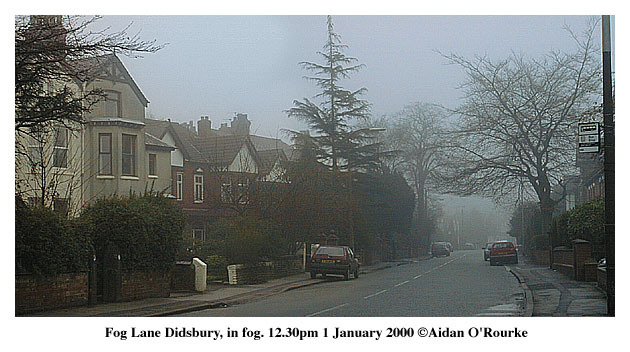 I go to Didsbury very often, but it's a different place to the one you left many years ago! I like your idea to put together a section about Manchester locations from feature films. I've been trying to figure out where the house is in Rusholme, that was featured in Hell Is A City. If I remember correctly, one shot shows a sign for 'Rusholme Grove'? I walk around there quite often and I've come to the conclusion that the house may have been demolished. The architecture of the house has 'Rusholme' written all over it (now you'll probably prove me wrong and reveal that it was somewhere else!). Isn't there also a scene involving a garage in an old church? I wonder whether the film studios on Dickenson Road were used at all on this movie? Or would they have been owned by the BBC by then? Thanks for your message and compliments especially appreciated as you are an accomplished photographer yourself. I've never managed to locate the house in Rusholme, or Rusholme Grove, which may be fictitious. I think the studios on Dickenson Road were taken over by the BBC during the 1950' - this film was made in 1959, I think. The garage and old church looks like Whalley Range to me. The final scene on the roof of the Refuge Building, now Palace Hotel, is one of my favourite bits of the film. This location is virtually unchanged and seen from the Medlock (left), has preserved a look of the past - Good place to shoot a historical drama! A brief update on the Victoria Baths (having just viewed the panoramic photos - very good). 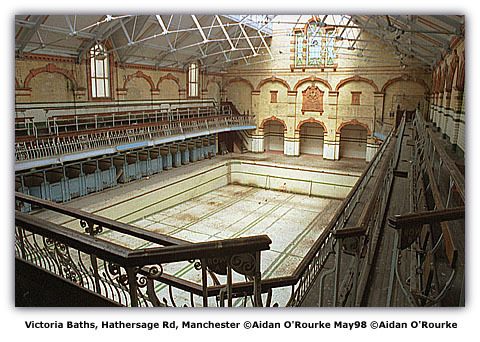 The Heritage Lottery Fund considered the bid for grant aid to restore the Victoria Baths as a healthy living centre and have deferred their decision, ie they are not saying "yes", but they are not saying "no". We, ie the Victoria Baths Trust / Victoria Baths Partnership have to revise our business plan. Renovation is therefore still several years off. 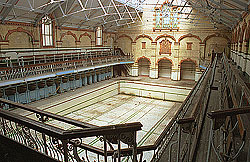 The next chance for people to see the Victoria Baths is Saturday 10th March. We will be open from 12noon to 4pm - guided tours, stalls, refreshments, a new short film shot in the Baths. You are doing an excellent job in saving this magnificent facility, which should never have been closed in the first place. It's a shame it is taking so long for funding to come through. I live just round the corner and will certainly become a regular visitor when, thanks to your efforts, it eventually opens. Many visitors to this website will remember going there as a child - I hope they won't have to wait too long to see it open again. I was pleasantly surprised to find that a street in Salford is named Blodwell St which happens to be my family name. I would love to know how it got its name. Here's hoping you can help! Street names can tell us a lot about the city, and the times in which the streets were created. Piccadilly was named after the fashionable London street, called after a shop on the corner which sold 'peccadillo' frills or 'little sins'. Mosley St was named after Oswald Mosley, Lord of the Manor in the 17th century. Radium St in Ancoats was German St, but this was changed in WW1 to commemorate medical achievements of the time. But as for Blodwell St - Sorry I have no idea! Can anyone help? Well how about the Pennine foothills at Saddleworth? Your message arrived co-incidentally as I was covering this area. I'd like to do the whole of the region from the Lake District to Shropshire, and from the Irish Sea to the Pennines, but that's a very large area for just one person and a camera to cover. I can only try and do a representative sample, but I'll try and get along to some of the places you mentioned. Subject: Photos after the blitz? I have been asked to give a talk at my 11 year-olds school here in the US about WWII. I was born in 1938 in Withington and remember a bit, but I wonder are there any before and after photos of central Manchester showing the absolute devastation? I used to visit my Grandmother in Hulme(?) in an old row house without electricity or indoor plumbing. I cannot remember the street, we walked from Oxford Street, down the road which had a big church (and underground toilets) and a cinema diagonally across from each other (Stretford Road? ), past Paulden's (? ), and then went left before we reached the big cross road. Paulden's was still standing (until it burnt down), and quite a few of the shops were standing on the road we walked down. The streets north were more heavily damaged I think. I have an OS map from the 1950's I'll try to compare it to the on-line maps to see what has changed. 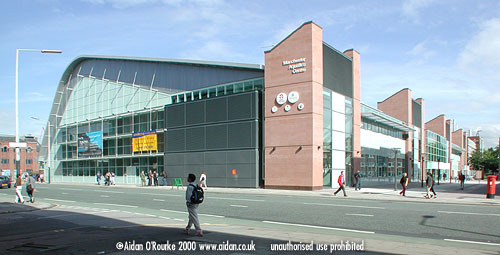 The books 'Memories of Manchester' and 'Memories of Manchester 2' have images which I'm sure you'd find interesting. If you're interested in buying them, please contact me. 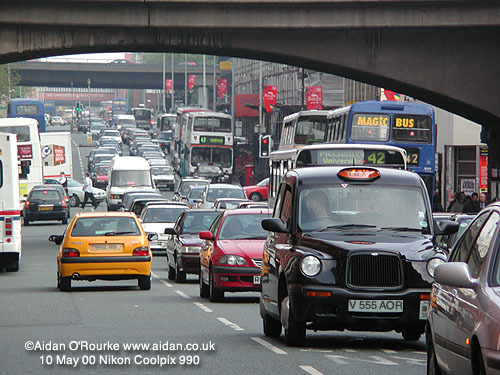 Could the road you walked down have been Oxford Road? The church might have been All Saints Church on the right - now demolished - and the cinema could have been the Grosvenor Picture Palace (above left). If you can get to Manchester, an excellent place to go is the Local Studies Unit at Manchester Central Library. They have a large collection of old photos accessible via computer terminal. Connections: Hulme West Didsbury Fallowfield. Hello Aidan, Love your photographs of lots of places I used to play. 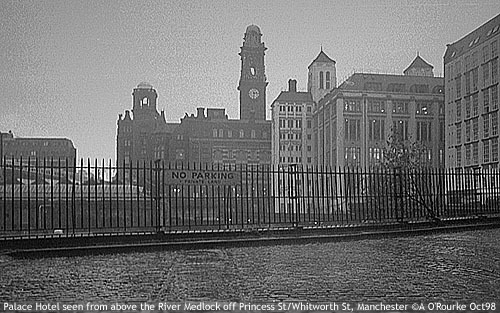 I went to St Georges school across the barracks - Hulme.Then St Marys Moss lane east, Then Ducie Avenue. As a child we would spend hours playing "house" using bricks off the bombed houses, you could go to bed at night hear the sirens go, and possibly the whole street next to you had disappered.I remember things like taking the accumulator to be recharged for the wireless, dangerous job that, queuing up at Kershaws Stretford road- freezing cold, just for something called bananas. The card you sent for Christmas was fab, I used to live near Platt Lane in later years and took my son to play in that park as often as I cold. When I was working I used to work with a girl called Eileen Bentley and she used to live on Dundonald road in Didsbury another of "your area" She married a builder called Roy Saxton, her and I shared the same birthday 1/8/38,lost touch years ago I often think about her, more so now since I got hooked on The Mancunian.I left UK Ocotober 73 with one son, I have now got three sons and a couple of grandsons. I have done your quiz, and considering I left so long ago I did really well. Keep up with your terrific work, I can tell people living in Manchester what is happening in their city. Glad you liked the quiz - I used to be swamped with childhood memories as an expat in Saudi Arabia, much more so than when I am here. It seems if you are divorced from your home area, your mind travels back much more into the past, especially when you see images of home. Thanks very much for your kind comments. I miss Manchester so much, since I graduated from that city 2 years ago and left. I just can't explain how much I love and miss it. Probably that was the time when I was exploring myself freely...without thinking lot of family stuff. And the environment for me as a Chinese is so exciting. I can still remember the lovely smell around my university there. 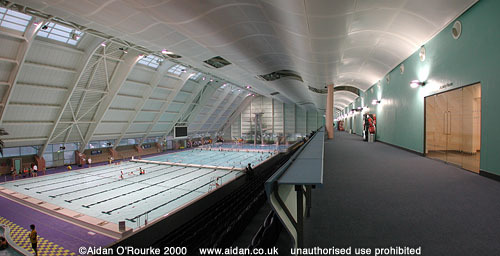 One thing I would like to know more about is the development around Oxford road....like the swimming pool for the Commonwealth Games and any other new buildings there? Have you got any pictures of them? Yes, I've included an interior and exterior shot of the Commonwealth Games pool, also known as the Manchester Aquatics Centre, and a shot of Oxford Road which I think you will recognise. Glad you enjoyed your stay in Manchester, and hope you'll be able to return some time. In the meantime you can visit Eyewitness in Manchester! The picture of the viaduct is that the one shown on the program, Where the Heart is. I also went to Lloyd Street School, official name was Limby Street, I left in 1949, and then went to City Road School,for l year then went to St Georges (which was in City Road school) until I left in 1953. Correct me if I'm wrong, but 'Where the Heart Is' is filmed in Marsden, Yorkshire (modern administrative county: West Yorkshire). There is a similar viaduct there - the line from Manchester to Huddersfield was constructed I think in 1849. And as for me, I wasn't 'constructed' until 1958 - five years after you left school - things have changed a lot since then! Thanks very much for your message. Message: Not to put the damper on all your efforts and beautiful photography, but isn't that the site of those horrific murders? You've touched on an important issue here - Certain places have become tainted due to connections with notorious crimes which tourist authorities will always try to avoid mentioning - This is true of Chicago & Al Capone, Hyde and Dr Harold Shipman and of course Saddleworth and the Hindleys. Actually they lived in Hattersley but they buried the bodies of their unfortunate victims on Saddleworth Moor. I think you'll agree, it's wrong that a place should be 'tainted' or judged on this basis. Life goes on and I'm sure most tourists who go to Saddleworth will find it a picturesque and interesting place. I just had to, you left Swinton out of your list and spelt Clifton wrong, it is not Clifden. still like your work though, had a problem for a while getting it on line, now the format has changed again made it easier to get again. Have a great week, JB. I have always produced Eyewitness in Manchester as a one man operation - That means that occasionally I will make errors. It's up to you to point them out to me, as you have done! Hope you will accept my work 'warts and all'! I seem to have confused the spelling of a piece of hallowed ground north west of Manchester with another piece of hallowed ground in the west of Ireland. 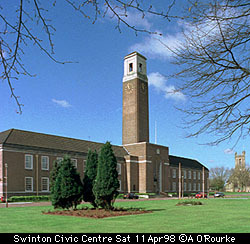 At least I didn't get Swinton confused with Swindon in the south of England. That really would have been sacrilege! I've included a picture of Swinton to try and make up for my carelessness! Sorry about that - A slip of the keyboard. I have corrected the error. Message: Hi there - I like the form! Could do with this on my site too. I love the Saddleworth pics so far, and am looking forward to seeing the rest. Thank you Mr Film Director, a native of the area in and around Saddleworth, but born, co-incidentally, in Swindon (with a D!). The form certainly makes it easier to format reader messages but I hope to include an even better one soon. Readers, find out more about Stephen Gibbons' film-making activities, it's quite fascinating. Message: I look forward to your visit to Levenshulme. Seemed strange to hear you call the place bohemian and scruffy AND a bit rough! I was brought up there in the 50s. My parents have lived in Manchester in the same "terraced" house (however it has a garden back and front) for over 55 years. My mother worked at Faireys' Engineering (planes) in the war. One of my strongest memories is of the smell of "McVities" which I can still smell when I visit my parents. Is your visit to Levenshulme imminent? The part of Levenshulme on the Stockport border is... 'posher' than the area closer to Longsight. 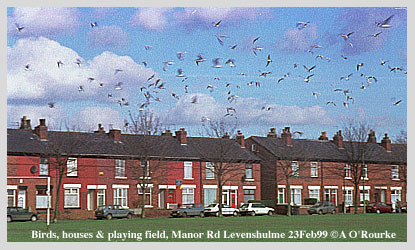 I know several people who live in Levenshulme, and they like it. Levenshulme has also become a strongly Irish district. I'll see if I can visit for the upcoming St Patrick's day celebrations. Dear Aidan I noticed that you were unsure as to the origins of the name 'Pots and Pans' - the hill overlooking the villages of Saddleworth. I was brought up in Greenfield and took many walks up and around the hills as a child. I was told a story that two giants once lived in the area, and didn't get on with each other very well. They used to throw pots and pans at each other, the remnants of which can be seen for miles around in the large 'broken rock' formations. I think these are south of the war memorial - you can see them clearly from Greenfield looking (East?) up towards the moors. I'm hoping to move back to the area shortly, so I will let you know any further information that I discover! Those giants must have had one hell of a flaming row as the stones are scattered all over the hilltops, and they are huge. Thanks very much indeed for your message and all the best.